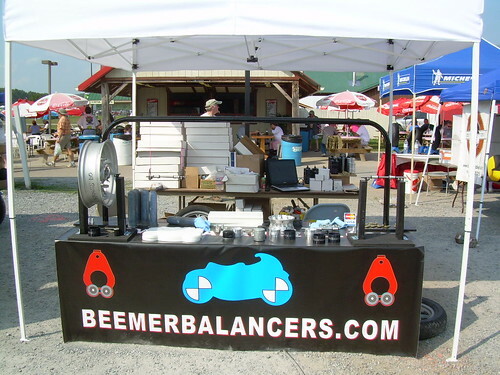 I worked at the BeemerBalancers.com vendor booth up at the BMW Motorcycle Rally in Essex Junction VT. The rally brought in about 12,000 BMW riders and enthusiasts and a whole lot of business and product awareness to BeemerBalancers.com. The show was a lot of fun and a big success. This coming weekend is the Vintage Motorcycle Days rally at the Mid-Ohio race track. I am planning on going to this as well, but not as part of a vendor. I look forward to the swap meet, which is supposedly the biggest motorcycle swap meet in the world. 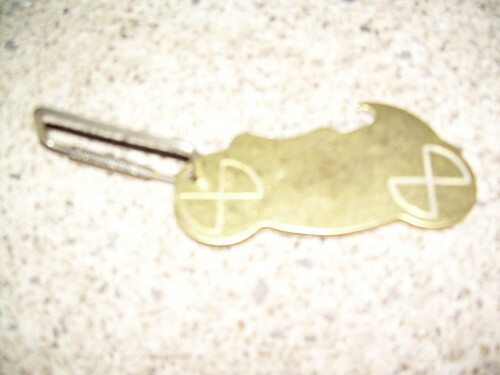 BeemerBalancers.com is selling a cool little keychain. Its styled after a BMW but should fill the need for any motorcyclist. It doubles as a bottle opener. It will be on their site tomorrow for $10.95 with free shipping. There will of course be a better picture of it there. You can probably get them though me too if you’d like, but BeemerBalancers.com will be easier for everyone. 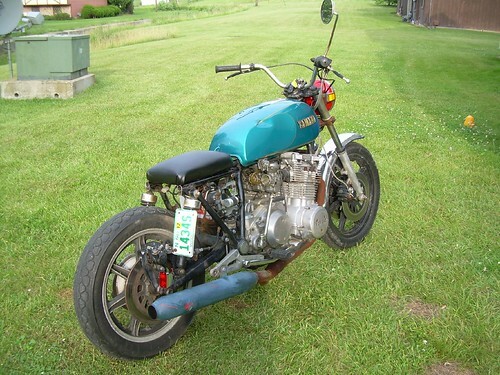 Yamaha used about 15 miles of excess unneeded cable when it built the xs11’s in the factory. On the left you can see all the stock wiring which I pulled into the open and cut the sheaths off of. 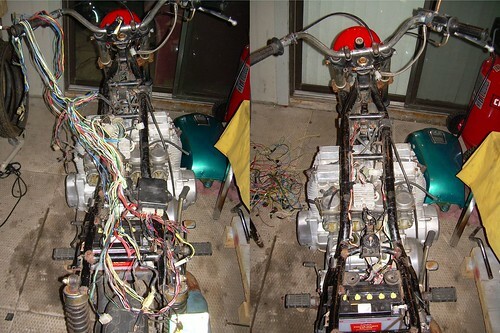 After half a day of determining which wires I actually needed to run the bike I ended up with the picture on the right. Just a few lone wires neatly tucked alongside the frame rails. The wiring that exists basically connects the battery, ignition system, ballast resistor, coils and regulator. Besides that every electronic component on the bike was removed. I still need to run a couple wires for the headlight and tail light, but they will be on their own seperate fused circuit so it is independent of the bikes other electrical. It was a lot of work, but it turned out great. One step at a time this bike is making a major transition. 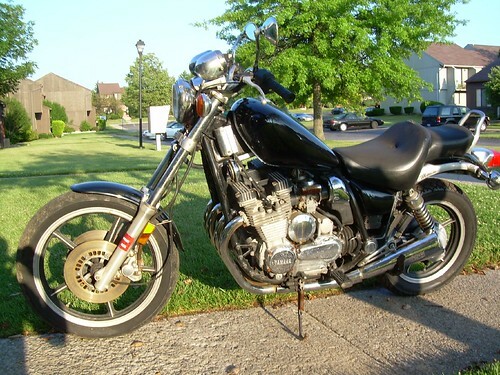 Today I began work on the 79 xs1100 that I’m going to bob out. I cut off the rear of the bike. Created mounts for a brake light under the rear caliper and a license plate over the rear shock. Swapped the pegs with an ’80 model because they are larger. Removed passenger pegs and mounts. Removed gauges. KZ550 headlight. Kickstart from the TX500. I have to order a small solo seat (the one that’s on there is just a quick one I built for testing purposes), some exhaust wrap, low bend bars, and new pod filters. Then some cleaning, re-paint and fresh rubber. This bike is going to be fire. And WOW is it fast.